Falávamos de fatiga digital à propósito da quebra de vendas de ebooks. Por várias razões que se conjugam: para todas as techs há um período de entusiasmo à sua adopção que depois arrefece, e quando essa voluntariedade cede lugar à prática do uso necessário novos hábitos e comportamentos amadurecem e estabelecem-se padrões que pouco devem a modas, e, às modas, porque não há respostas simples. Segue-se puff piece do Guardian de hoje para textura futura às nossas deambulações, sobre o relatório da Publishers Association do UK, igualmente de hoje: as modas, e as práticas, as quebras de vendas de ebooks associado à fatiga digital. Resumo de executivo: vendas: good, ebook down. Figures released today by the Publishers Association shows that 2016 was a record breaking year for the publishing industry with sales of books and journals reaching £4.8bn, their highest ever level. Digital sales also substantially increased in 2016 reflecting the significant investment publishers are making in new technology. eBook sales were down by 3% continuing a trend seen for the first time last year. Voltaremos a este aumento de vendas nas áreas do "academic and research publishers", "primary and secondary learning materials", e do áudio nas considerações de hoje. It’s not about the death of ebooks, it’s about ebooks finding their natural level. It was always very clear that we would have a correction and reach an equilibrium. People have books in their house as pieces of art. This helps to explain the reinvigoration of independent bookshops, which offer a more styled, or curated, experience. It was new and exciting but now they look so clunky and unhip, don’t they? Everyone wants a piece of trendy tech and, unfortunately, there aren’t trendy tech reading devices and I don’t think people are reading long-form fiction on their phones. There are other reasons for the decline of consumer ebooks. Children’s books, which represent an area of significant growth, just don’t work well on e-readers. Ebooks, which are not things of beauty, have become more expensive; a new digital fiction release is often only a pound or two cheaper than a hardback. A distinção de meios é-nos interessante porque exemplifica a separação do conteúdo ao seu suporte, e a independência do primeiro em relação ao segundo pode não tornar o primeiro mais relevante, mas transformar o segundo num novo protagonista que poderá eclipsar em importância o seu conteúdo: o perigo do arsty-fartsy ronda por perto. Once upon a time, people bought books because they liked reading. Now they buy books because they like books. Recordemos-nos então do sucesso da literatura académica e aprendizagem no digital mencionados atrás, assim como o aumento das vendas dos audio-books (*) que o relatório regista: entre os que não sentem o apelo ao objecto físico per se e priorizam a informação disponível e o seu consumo, o digital parece continuar a ser a ferramenta de eleição. * The rise of audio is one area of digital success. Audio is becoming something of a new battleground in publishing, where audio publishers want to see books on submission at the same time as physical publishers, while physical publishers have become disinclined to acquire books without audio rights. Punx, a prestar atenção ainda? O objecto é o final da viagem, o veiculo de informação a bagagem para uma: reconhecer a diferença para chegar ao destino é fundamental. Estamos nisto para sentar no sofá a fazer cócegas aos livros, ou a escrever literatura para levantar do sofá? I think your average reader would say that one of the great pleasures of reading is the physical turning of the page. It slows you down and makes you think. The last thing any seller or publisher of physical books wants is the death of the ebook. “We want people to read. We don’t mind how they read,” People who read, sooner or later, will buy books. Nota sobre estes números anteriores já que estamos no tópico: são relatórios da indústria, depois há o que lhe escapa ao radar. The figures from the Publishing Association should be treated with some caution. They exclude self-published books, a sizable market for ebooks. And, according to Dan Franklin, a digital publishing specialist, more than 50% of genre sales are on ebook. Bottom line, passamos agora a palavra ao público. "so it's you!" + "why u wanna copy other peoples ideas?"... ou o que está no meio. I think people like books because of the other sensory stimulation, apart from reading it. Admiring the craftsmanship, the feel of the pages, the SMELL of it. These all add to the enjoyment. I have no doubt e-books have their place and will continue to grow, but I don't foresee the end of paper books in my lifetime. People didn't stop painting portraits or landscapes when photography came along; they didn't stop going to plays when movies came along. They aren't going to stop reading books either. Add to the list of Kindle's UI woes the arbitrary restriction on sharing text. You can't simply copy and paste. 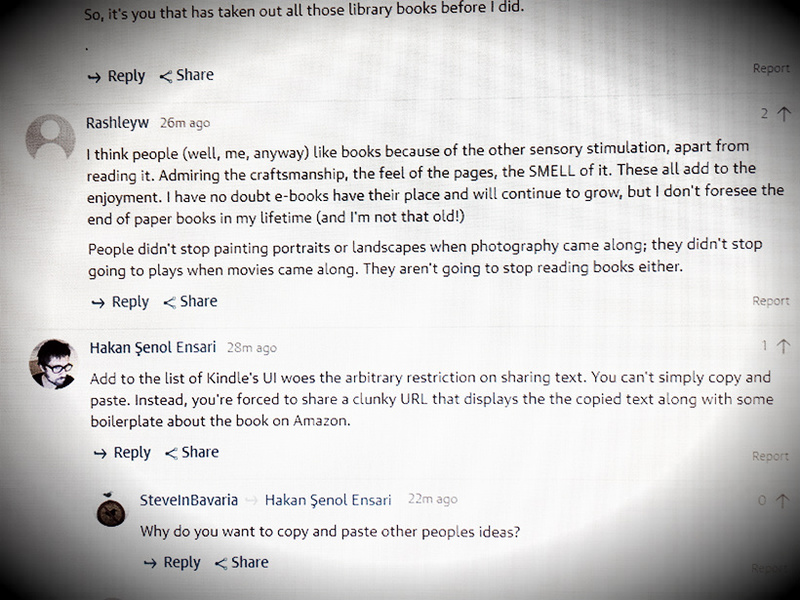 Instead, you're forced to share a clunky URL that displays the the copied text along with some boilerplate about the book on Amazon. O fetiche de um objecto. As limitações de outro. Novamente da nossa experiência pessoal e história das tecnologias, e onde homem e a máquina interagem: i) todas as limitações de uso inerentes à tecnologia são ultrapassadas na sua evolução; ii) há comportamentos e hábitos que nada devem à tecnologia: esses, não mudam. Compreender a diferença de ambos é fulcral.